Greed isn’t only good for Wall Street’s Gordon Gekko; it’s a powerful tool for The Joneses too. 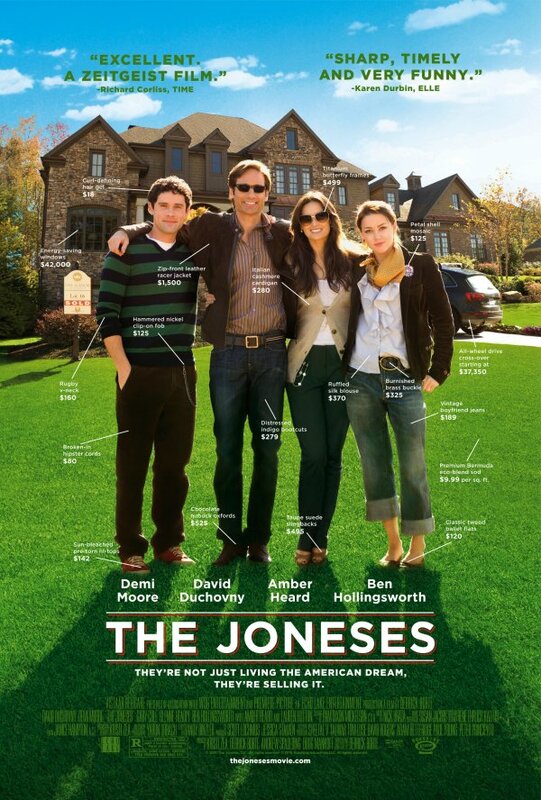 Demi Moore, David Duchovny, Amber Heard and Ben Hollingsworth star as a seemingly typical suburban family in The Joneses. They get to live in a beautiful gated community, have a magnificent home and enjoy all of life’s luxuries under one condition: they get their wealthy neighbors to want what they have. The Joneses are actually not a real family at all; they’re working for a stealth marketing organization. Check out the film’s new wonderfully appropriate poster below. Not only does it provide a clear sense of what the movie is about, it does so in a subtle manner. There’s also a number of minor details to examine, encouraging you to do a double take. It’s too bad the poster doesn’t include a release date, because I would have been sold.